The deadly 85th Percentile Rule has gone mainstream. Credit the LA Times’ Laura Nelson for interrupting the paper’s move to El Segundo with a front page story explaining how and why speeds are set at the speed of the 15th fastest driver on the street — the 85th percentile of drivers. To update driver speeds, city engineers visit a street in the late morning or early afternoon, park along a stretch of road without stop signs or traffic lights, and use an electronic device to measure the speeds of 100 drivers. They rank the speeds from fastest to slowest and identify the 85th percentile — that is, the speed just below the 15th-fastest driver. City engineers use that “critical speed” as a basis for establishing a new speed limit, typically rounded to the nearest 5 mph. Which means drivers can set the speeds with their right foots. Which is kind of like putting bank robbers in charge of security at Wells Fargo. Although that might be an improvement over their recent scandals, but still. Failing to conduct those surveys, or raise speeds as a result, means police officers are prohibited from using speed guns or other electronic devices to stop speeders. And drivers can go as fast as traffic and LA’s over-engineered streets will allow. Traffic officers have been particularly hamstrung in the San Fernando Valley, where the majority of the city’s speeding tickets are written and more than 130 miles of streets carry speed enforcement restrictions, according to a Times analysis of city data. Particularly the lives of bike riders and pedestrians. There have been numerous failed attempts to reform the 85th Percentile Law, each dying in the legislature over fears that speeding drivers will have to slow down or get the tickets they deserve. Maybe this story will finally motivate homeowners to join with bicycle and pedestrian advocate, to demand that state legislators change the law that imposes highway speeds on city streets. And leaves far too many bodies in its wake. An Australian bike rider suffered a broken collarbone and fractured ribs when he was clotheslined by a garden hose stretched across a roadway. A rider in South Africa blacked out — and was nearly decapitated — when he struck a fencing wire that had been strung across a bike trail at neck height; fortunately, the wire snapped, preventing serious injury. Someone vandalized a pair of cyclist resting posts in Vernon, British Columbia, which position riders in the right spot to be recognized by traffic signals, and allow the rider to rest at the light without unclipping. Note: I originally wrote this as Vernon, California; thanks to Joe Linton for the correction. And police in New York are continuing their decidedly non-bike friendly ways by ticketing bicyclists riding in a new privately developed park where planners somehow left out bike lanes on the wide, one way street. If you were planning to ride Topanga Canyon next weekend, you might want to start making other plans. The newly affordable Metro Bike bikeshare is expanding onto the Westside towards the end of this year, and wants your input on where to put docking stations. Los Angeles is installing intelligent traffic signal controllers throughout the city, in part to allow the installation of bike traffic signals. Bike Talk talks with bike shop owner and advocate Carlos Morales. The Hollywood Reporter says a backlash is brewing against e-scooters, which are being blamed for crashes and near-crashes with bicyclists and pedestrians. A Michigan man who attempted to ride all of Route 66 in honor of his late son arrived in Santa Monica last week, raising $10,000 for pediatric cancer research. Bike SD expresses concern that a bikeway is being held hostage by a neighborhood planning group. A writer takes an epic carfree ride down Highway 1 where it was closed down by a Big Sur mud slide; the highway was just reopened to cars last week. Now that’s more like it. A road in the Presidio will be closed to cars to improve safety for San Francisco cyclists and pedestrians. A California appeals court has denied a plea from Marin cyclist Jeff Smock to overturn his road rage conviction for beating a truck driver senseless after the driver allegedly clipped him with the truck’s side mirror. He appealed despite receiving a slap on the wrist for the conviction. Marin County vows to appeal a judge’s ruling blocking mountain bikes from using a single track trail that had recently been widened to make room for people on bikes, as well as on foot and horseback. Bike Snob says kissing bike lanes is the new equivalent of politicians kissing babies, as support grows for bicycling. Except in Los Angeles, where elected leaders quake in fear of angry four-wheeled voters. Bicycling rates the year’s fastest, funnest and most exciting ebikes. And more clickbait from the magazine, as they list their picks for the 30 greatest bike moments in pop culture. Bicycle Times offers tips on how to smuggle documents like cycling legend Gino Bartali. Mobility Lab shares a nice piece from Melissa Balmer and Jay Walljasper, who say bicycling really is for everyone. Travel site Lonely Planet says you don’t have to drive to get your kicks on Route 66 anymore. A self-described Spandex Mafia shows up in defense of an Oregon protected bike lane, after a city councilmember uses the term to disparage people on bikes. Las Vegas bike riders get their own carfree open streets event when they’re allowed on a 25-mile segment of new freeway before its opened to cars next month. Salt Lake City bicyclists ride to remember a 23-year old man who was killed in a collision with a train on a late night group ride; the crossing gates reportedly went up after train passed in one direction, then quickly came back down when a second train approached from the other, catching his bike on the tracks. Horrible news from Houston, where a renowned cardiologist was shot and killed as he was riding his bicycle by a bicyclist who passed him, then turned around and fired; he had treated former President George H.W. Bush for a heart condition several years ago. No word on a suspect or what may have prompted the shooting. Thanks to Ed Ryder for the link. Dallas bike riders say more has to be done to protect bicyclists, following the hit-and-run death of a rider who reportedly did everything right. A new book describes the history of bicycling in the Windy City. The World Naked Bike Ride strips down and rolls through St. Louis. But how can you tell when a bike-riding Wookie is naked? St. Louis is renovating a velodrome popularly known as Mr. Bumpy Face because of the rough track. The Indiana Business Journal gets it right, as an urban designer and university professor says the streets belong to all of us, even e-scooter users. A South Carolina doctor decries the lack of support for healthy activities in the area after drivers succeeded in demanding the removal of a new lane reduction and bike lanes before the project was even finished. Bike Radar offers advice on how to climb hills faster. If you’re over 50, running or bicycling to work can cut your risk of a heart attack as much as a third. Road.cc lists the UK’s best smartphone apps for bicycling, some of which should be available in the US. A new 85-mile Calgary bike path connects 55 communities with over 400,000 people. And links to a 621-mile bike path network, the longest bike path network in the world. Tragic news from Calgary, where a 75-year old man was killed in a collision with a bike rider as he was walking in a marked crosswalk; the rider allegedly ran the red light, but remained on the scene after the crash. The local newspaper says someone is going to get killed on a bikeway bypass around a temporarily closed footbridge in Ottawa, Canada; a safer plan was nixed when people signed a petition preferring parking over preventing injuries to people on bikes. The Department of DIY has struck once again, as Ottawa bicyclists build their own pop-up protected bike lanes using orange and black highway cones. Louis Garneau — yes, that Louis Garneau — was seriously injured when he touched wheels with another rider on a Montreal group ride; the founder of the popular bikewear line suffered a concussion and punctured lung, but credited his helmet with saving his life. No bias here. A Toronto newspaper portrays a conflict between people on bikes and residents of a hill country community as cyclists versus blue collar locals. Never mind that some of the riders live in the community, and many bike riders are decidedly blue collar. The former bike-riding parking cop who gained fame on Twitter for ticketing bike lane blockers is now running for the Toronto city council. A British man who was left paralyzed when he was struck by a distracted driver while riding his bike is demanding that phone makers automatically lock devices when a car is in motion. Teenagers under 18 can now legally ride on sidewalks in Australia’s New South Wales state. Rouler looks at the classic Tour de France illustrations of Roger Blachon. American cyclist Lawson Craddock explains how he’s surviving the Tour de France with a broken shoulder blade, completing all 15 stages so far after falling in the first stage. His suffering has raised nearly $130,000 for a Houston velodrome. Dan Martin says when you’re bored, attack. On the other hand, punching another rider is apparently frowned on, as Team Sky’s Gianni Moscon learned the hard way. To the surprise of absolutely no one, Tour de France fans continue to get on Chris Froome, even though he was officially cleared of doping charges recently. However, the fans are reportedly getting out of control. An Ontario writer recounts Canada’s contribution to the Tour de France. Twenty-three-year old Dutch cyclist Mathieu van der Poel has become the first rider to win national championships in cyclocross, road cycling and cross-country mountain biking. A Spanish Continental rider offers the latest proof that the era of doping is not over. Your ebike could be rolling on automotive hand-me-downs. Spit your mouthwash out before riding into Peridot. And you won’t want to miss the world’s cutest bike race, even though one of the competitors evidently did. One quick note. Come back after 11:00 this morning for a guest post from Derrick Paul about the planned Vision Zero lane reduction and complete street project on Temple Street. And why it hasn’t happened. Los Angeles will be raising speed limits on nearly 100 miles of streets to comply with California’s deadly 85th Percentile Law, which allows drivers to set speed limits by applying their foot to the gas pedal. Meanwhile, speed limits will decrease somewhat on a little more than 52 miles of streets. The tradeoff is that police will now be able to use radar to enforce speeds, which they had been banned from doing on nearly 80% of LA streets. Under the terms of the law, police can’t use radar to enforce the speed limit if a street hasn’t had a speed survey within the last seven years. Once the survey is conducted, the speed limit must be set at the speed driven by the 15th fastest motorist driving unimpeded in non-rush hour traffic, although the city does have the option to round down slightly. So in order to make our streets safer, we have to make them faster and more dangerous. Or just repeal a stupid, outdated and deadly law. Correction: In my haste last night, I mistakenly wrote that the 85th Percentile Law was based on the average speed of 85% of motorists, ignoring my gut feeling that I was wrong, but too tired to stop and look it up. And I was right. That I was wrong, that is. The following email from Casey Kerrigan clarifies this complicated law better than any other explanation I’ve seen. When doing the speed survey the speed limit is based on the 85 percentile not on the average speed of 85% of the cars surveyed. Note that speed surveys are conduced under the optimal conditions to speed, ie during the day, at a non rush hour time and only the speed of free flowing cars are measures. Free flowing are cars with no traffic ahead of them for at least 5 seconds on a straightaway and unmarked cars are used to house the speed measurement equipment. This is from the Caltrans guidelines for how to set speed limits which you can find here. This paragraph is taken from the Caltrans guidelines linked above on page 36. If 100 vehicle speeds are plotted, the 85th percentile speed is determined by looking at the speed of the 15th vehicle down from the top speed. Fifteen percent of the vehicles are travelling faster than this speed, and eighty five percent are travelling at or below this speed. If less than 100 vehicles are counted, the 85th percentile speed must be determined by calculating 85 percent of the number of vehicles counted and determining the vehicles’ 85th percentile speed. For example if 70 vehicles were counted, 0.85 x 70 = 59.5. The speed of vehicle 60 represents the 85th percentile. Examples are shown in Appendix A on the Speed Zone Survey Sheet examples. Speaking of which, Vision Zero Los Angeles has released their 2018 Action Plan & Progress Report. The city plans to remain on course with the program, despite a sharp jump in pedestrian deaths, and badly missing Mayor Eric Garcetti’s goal of a 20% reduction in traffic fatalities in 2017. Of course, that was overly ambitious, since the program is just now gaining its footing and getting its first real funding. The LA River Bike Path has reopened in Long Beach, where it had been closed for construction work, now that a large construction crane has been removed. However, work vehicles and flaggers will remain on the path, and riders may be required to slow down or walk their bikes through the construction zone. Thanks to Long Beach Mobility and Healthy Living Programs Officers Michelle Mowery for the heads-up. Rent-a-cops driving on a Chicago bike path lose it when a bike rider complains that they don’t belong on the path. Thanks to J. Patrick Lynch for the link. The victim’s missing head was finally found in an LA multi-modal murder. A UCLA letter writer says scofflaw Bird scooter users are no worse than bike riders, who he can’t recall ever having seen “obey the traffic laws to the letter.” Unlike pedestrians and motorists, who evidently always obey the letter of the law in his eyes. CiclaValley imagines what a re-imagined, bike-friendly Ventura Blvd could be. The Pasadena Star News looks at the proposal to reconfigure Orange Grove Blvd into a complete street that welcomes everyone. Seven proposed U.S. Bicycle Routes could soon be coming to, and through, California. Encinitas-based cruiser bike-maker Electra Bicycle Company turns 25. Cycling Without Age comes to Merced. A pair of dueling Op-Eds in the Sacramento Bee say a bill to allow mountain bikes in wilderness areas would be good for the backcountry, while another calls it a Trojan horse that would put wheels over wilderness. Bike Snob says enough with the helmet shaming, already. Streetsblog says American cities aren’t making much progress on Vision Zero, except for New York and San Francisco. Although for some reason, they aren’t tracking Los Angeles on their chart. A Seattle-area man had his bike stolen after he was hit on the head with a pipe. No word on whether he was wearing a helmet, which might have helped. Or not. Washington is the latest state to approve an ebike classification bill based on the one pioneered in California. Great idea, as a Washington bike school teams with a woodworking school to teach everything from wrenching to wood frame and wheel building. Evidently, LA drivers aren’t the only ones who complain about removing traffic lanes from massive streets. Tempe AZ will restripe a roadway to remove bollards protecting a bike lane and add back a third traffic lane in response to motorist complaints. You’ve got to be kidding. Just days after the Utah house approved an Idaho stop law, a bill that would allow drivers to also treat red lights as stop signs passed a legislative committee. 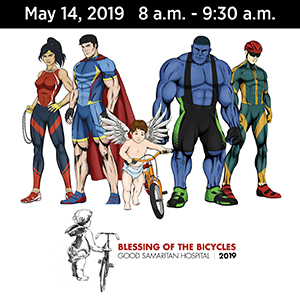 After all, what difference could there possibly be between someone on a 15-pound bike and someone wrapped in two tons of high-speed glass and steel? I mean, other than the bodies the latter would likely leave behind? Plans for a new bridge on I-10 in Mobile, Alabama will be required to include options for bicycle and pedestrian pathways. Cycling Tips offers advice on how to use music to get the best out of your rides. They probably don’t mean singing Hank Williams out loud while you ride, as someone who looks a lot like me may or may not have done on occasion. Toronto rejects a staff recommendation to remove lanes from a major street, and keep it six lanes and dangerous instead. Caught on video: British police use bike cam video to prosecute a 50 mph punishment pass, resulting in the equivalent of a $365 fine. A much better punishment would be to make the driver stand in the roadway while someone else does it to him. The Irish government will introduce a safe passing law mandating that drivers pass bicyclists with the rough equivalent of three feet on roads with a speed limit below 31 mph, and five feet above that. Eat and bike your way across Italy with Top Chef contestants. The war on cars may be a myth, but the war bikes is all too real, as Aussie bicyclists find thumbtacks spread across at least four popular riding routes. Far from a harmless prank, something like that can cause serious injuries — or worse — if a flat causes a rider to fall. And should be prosecuted as such. The government of Queensland, Australia, has introduced a presumed liability bill, which would presume that the operator of the more dangerous vehicle has a greater responsibility to avoid crashes, and would be considered at fault in a collision; the head of the local auto club calls it a divisive bill that pits motorists against cyclists. Actually, motorists have done that themselves for decades. Your WiFi depends on a Hollywood bombshell who escaped Nazis and an unhappy marriage on a bicycle. It’s golf balls over bikes on the beach. And can a serial burglar really be a bad guy if he rides a bike and leaves the homes neat and tidy? 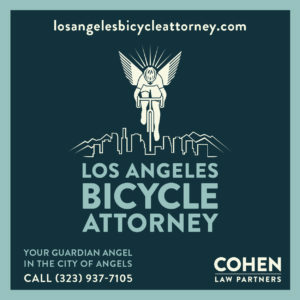 Thanks to View-Speed for their generous contribution to help keep BikinginLA coming your way every day. Click here if you’d like to donate to help support this site. The good news is, we’ve figured out what caused the problem with email notifications for new posts. Now that the tech supports are back from their annual conference, maybe we can get it working again. Governor Jerry Brown signed legislation prohibiting drivers from holding and operating mobile phones for almost any reason, including changing a play list or using a GPS. However, in a sign of just how seriously the state doesn’t take distracted driving, the fine for the first violation is a measly $20, rising to a whole $50 for subsequent violations. Even though distracted driving is every bit as deadly as drunk driving. And people will continue to die until we treat it that way. Seattle votes to lower speed limits on city streets, from 25/30 mph to 20/25 mph as part of the city’s Vision Zero plan. Which is exactly what LA has to do if there’s any hope of reducing, let alone eliminating, traffic fatalities by 2025. Yet here in the City of Angels, the case is complicated by streets with near-highway speeds as a result of the deadly 85% rule, which sets speed limits at the average speed of 85% of drivers on any given street. In other words, the best way to make sure the speed limit goes up is to keep your foot firmly planted on the gas pedal. Which is kind of like putting bank robbers in charge of bank security. Never mind that speed limits are unenforceable by radar guns on roughly 75% of the city’s streets, thanks to the city’s failure to conduct the required speed surveys. And never mind that decades of flawed traffic planning has left Los Angeles with countless streets engineered to carry traffic at speeds far beyond the posted limits, and too many drivers more than happy to take advantage of that. Angelenos have gotten used to driving that extra 10 to 15 mph above the speed limit, even on streets with posted limits of 45 mph or more. We could see open rebellion and riots in the streets if the police started cracking down on speeders — or at least a number of recall threats and angry letters to the Times. Let alone if city officials found a way around the 85% law to lower limits to life-sparing levels. Because until we do, Vision Zero will be nothing more than a couple of words. Maybe the national obsession with scary clowns is just a tad out of control. Consider this report from Portland, Tennessee about the arrest of pranksters posing as clowns. Portland (TN) police received another call Tuesday morning reporting a clown was riding a bicycle near Highways 109 and 52. The report was false and police found a person riding a bike wearing a safety vest with flashing lights to warn traffic, Heavner said. Cycling scion Taylor Phinney jumps to the Boulder CO-based Cannondale-Drapac team for 2017, just two years removed from the crash that nearly ended his racing career; Cycling Tips offers a good profile of the 26-year old racer as he works to revitalize his career. Atlas Obscura looks at the demise of America’s love affair with six-day track cycling competitions of the ‘20s and ‘30s. Richard Risemberg argues the benefits of a road diet on 6th Street in the face of NIMBY opposition. CiclaValley offers a recap of recent bike cam videos, including yesterday’s big bike lane dump in Griffith Park and a dump off his bike at the Griffith Observatory. World Car-Free Day may be over, but Santa Monica gets into the act on October 7th. 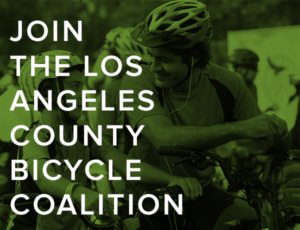 The Pasadena Complete Streets Coalition and Bike SGV wants your input if you walk or bike in the San Gabriel Valley. Damien Newton talks with Wesley Reutimann about the rescheduled 626 Golden Streets open streets event. San Diego’s Measure A would raise $18 billion for transportation infrastructure, but just $540 million would be set aside for bicycle and pedestrian improvements. Chula Vista applies for funds to build a four-mile bike lane and make other bike and pedestrian safety improvements on a street where 33 bicyclists were involved in collisions over a four year period. Three Redlands cyclists are riding 250 miles to Las Vegas to raise funds for underprivileged kids. Cities around the US are using temporary, pop-up traffic installations to see if they work before making permanent changes. Which is a smart way of avoiding the inevitable panic that stops most projects before they ever start. Students at the University of New Mexico pitch in to buy a new bicycle for a fellow student after his was stolen. The nation’s best bike city, as anointed by Bicycle Magazine, has suffered six bicycling fatalities this year, all involving commercial vehicles. Meanwhile, a Chicago TV station finds the city’s bike lanes are often blocked by parked vehicles, despite a city ordinance prohibiting it. A Michigan middle school student barely avoided becoming collateral damage when he jumped off his bike just before a van involved in a collision rolled over it. Something is seriously wrong when a Western PA bike rider faces jail for taking the lane. Boston’s bikeshare system really doesn’t want anyone riding their bikes on a busy highway. New Yorkers are shaming drivers who block bike lanes on a new interactive website. A Delaware cyclist says he’s giving up riding after he was rear-ended by a car, saying local roads are too dangerous and drivers don’t care. Nice gesture, as Atlanta considers naming a one-block section of the Peachtree Street bike lane after the co-founder of the Atlanta Bicycle Coalition after he died of a brain tumor. Treehugger says Toronto has zero vision when it comes to Vision Zero. A London supermarket will test one hour bicycle delivery. A British cop stepped away from his duties protecting the US ambassador to save the life of a cyclist; the rider flew through the rear window of a parked car when he crashed into it on a training ride. Scotland is in danger of missing their goal of having one in ten journeys made by bicycle by the year 2020, as ridership declined slightly last year. A beautiful new 2/3-mile bike and pedestrian suspension bridge will be the longest bridge in Finland when it’s finished. Turkey opens its first bike themed and bike friendly resort hotel. 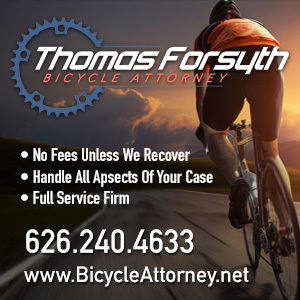 A South African cyclist faces charges after he became enraged when a driver honked at him, attacking both her and a second rider who came to her defense, then throwing a cup of hot coffee at her husband when they spotted him at a bistro. Seriously, no matter what a driver does, violence is never the answer. Nor is losing control of yourself. An Aussie cyclist takes silver in finishing her seventh triathlon, just three years after receiving a heart and double lung transplant. A Chinese cyclist rode from China to Portugal, covering just under 1,000 miles in 87 days. When you’re on parole and carrying stolen credit cards and prescription drugs, it’s probably a good idea to obey local bike laws. If you’re carrying coke on your bike and have outstanding warrants, put a light on it — and don’t pass yourself off as your warrantless brother. And the underwater mountain bike season is officially over. Charge filed in death of bike-riding Cal Poly Pomona student Ivan Aguilar; is the university really at fault? A bike-riding college student is dead. The driver who took his life faces a relative slap on the wrist. And the campus where he was killed appears to be doing little or nothing to protect cyclists on campus. Instead, Cal Poly Pomona seems to be hiding behind California’s devastating 85th Percentile Law to justify plans to raise speed limits on campus, making it even more dangerous for anyone on foot or two wheels. Or at least, that was the gist of a Twitter conversation I had with representatives of the school Wednesday morning. The outpouring of grief that followed the death of Cal Poly Pomona student and cyclist Ivan Aguilar should have spurred immediate action to tame what is reportedly dangerously out of control traffic on campus, where numerous students have reported feeling unsafe walking or biking. Yet four months later, no changes have been made to protect students and faculty — not even on the street where Aguilar lost his life. And none are currently planned. In fact, the school’s new 2013 traffic study doesn’t even include the words bicycle, bicyclist or pedestrian, according to a story by Beau Yarbrough in the Daily Bulletin. Kind of makes it hard to make meaningful improvements when nothing is considered except speeding motor vehicle traffic flow. Although to be fair, they have talked about bikes. But traffic plans that don’t even consider non-motorized transportation show just how out of touch campus leaders are. And how far the school has to go to make it safe for anyone, let alone everyone, whether on two feet, two wheels or four. Apparently, those students are right to be afraid. Especially when the death of a popular and promising young man leads to nothing more serious than a misdemeanor charge with a maximum penalty of just one year in county jail. According to the Daily Bulletin, CPP Civil Engineering student Gonzalo Aranguiz Salazar will face a charge of misdemeanor vehicular manslaughter without gross negligence. In other words, pretty much the mildest charge authorities could file under the circumstances, while still holding someone accountable for the death. I’ve yet to see any description from any source of how the collision occurred. No word whatsoever on how fast the driver was going, or if he broke any traffic laws leading up to the impact with Aguilar. Apparently, it’s on a need to know basis. And no one with knowledge of the investigation seems to think you or I need to know. We’re just expected to accept that the charges are fair and appropriate given the top secret circumstances. Sort of like we’re supposed to trust that campus administrators have the safety of their students at heart, on a campus that does not include a single inch of bicycling infrastructure. Beverly Hills, meet your collegiate counterpart. In all honesty, I’m not sure Salazar is the one who should be facing charges. But you can’t charge a college with living in the auto-centric past and favoring motorists at the expense of every other road user. As much as it may be deserved. But something tells me Cal Poly Pomona won’t make the list of bicycle-friendly universities anytime soon. It is impossible to find solutions when you’re busy making excuses. And Boyonabike reminds me of something I let slide from the Daily Bulletin story about the Salazar charge, and shouldn’t have. The story quotes Megan Chaney, director of Clinical Programs and Experiential Learning and Associate Professor of Law at the University of La Verne College of Law, explaining why a misdemeanor charge may be appropriate in this case. As a society, we’ve chosen not to hold drivers responsible for all but the most extreme actions behind the wheel. The collisions that result from carelessness, distraction or relatively minor violations of the law are excused as mere accidents, and left for the insurance companies to deal with, with little or no consequences for the drivers involved. And that’s why we continue to have 30,000 +/- deaths on American streets each year. It may be the current legal standard. But actions that result in the death or serious injuries of others should never be accepted. Or excused. Motor vehicles are, by their very nature, dangerous machines, and their operators can and should be expected to use the same caution behind the wheel that we expect from those involved in any other hazardous situation. When life is taken more seriously than simple convenience on our streets, then — and only then — will anyone be safe on our streets.